In half term Jess, Dad and I went to Scotland to see my grandma. One day we all went to Blair Drummond Safari Park in Stirling, which was really good fun. The first thing we saw we we got there was the rhinos, including one which was only 3 weeks old. Bruce is a white rhino and was born on October 12th. He weighed eight stone at birth, so he was already much bigger than me. His mum is called Dot and when started walking around, Bruce followed right behind her. It was so cute. One of the clever things about the park was the giraffe viewing platform. Usually at places you have to strain your head upwards to look at the giraffes but at this safari park you are the same level as the animals which made it even cooler. There were lots of animals at the park and lots of things to do as well. There were puzzles to complete and machines to use. My favourites were the diggers, where you had to work out how to control picking up the sand and dropping it somewhere else. I also liked the rhino and elephant puzzles. You were given lots of different pieces which together made an animal. Me and Jess raced each other. I won. There were lots of competitions to enter too, and I enjoyed the drawing contest the most. Another thing I liked about the safari was the funfair. It had lots of rides and games but I must say that the roller coaster, which was so slow, and the arcade were quite disappointing. In the arcade there were those games where you put a coin in and lots of coins fall out the bottom. I put a 10p in and saw a pound’s worth of coins fall through the gap, yet none actually came out for me to collect. My favourite ride was the slide it was so fast and so high up. But my favourite bit of the whole day was the sea lion show. The man would mention things that sea lions could do and at that exact moment a sea lion would demonstrate what the man was talking about. Whenever you clapped, the sea lions would clap as well – it was really funny. The best trick was when one of the animals went into a pool, picked a basketball up on its nose, swam to the side of the pool, got out and jumped onto a stool. The ball stayed on its nose the whole time. Another of the tricks I liked was when the man said “sea lions have lots of predators. One of our sea lions will act one out.” Then the sea lion jumped into the pool put his arm out and swam around. It looked exactly like a shark. One of the highlights of the day was the chimpanzee island. We went round the island on a boat and learnt lots of very interesting things that I never knew before. When Jess and I were on the pedal boats we could see people zip over us on the Flying Fox zip wire (we also had a go, and it was great). It was a wonderful and educational day and you should definitely visit. But remember to bring a scarf and gloves! The Safari Park is now closed for the winter and opens again in March. Tickets cost £12.60 for adults and £9.60 for children (aged 3-14). Under 3s are free. We’re linking up with Country Kids over at Coombe Mill today. Take a trip over there and you can find lots of other country fun. 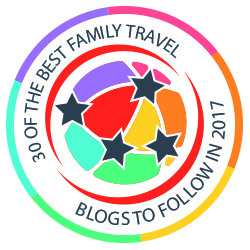 Our blog is nominated for the UK Blog Awards. Please vote for us here – it only takes a minute and we would really appreciate it. Thanks very much. What an amazing looking safari park with so much going on. I love the look of the giraffes from up at their level and a fun fair too, that is so much fun all in one place though the rides sound a little disappointing. I’d love to have a zip wire like that across the valley here at Coombe Mill. Thank you for sharing your day on Country Kids. They really aren’t. Thanks for the nice comment. Looks like a great day out. I love going to the zoo, and your giraffe picture certainly looks like he’s trying to tell us something? This looks like a great place to go. It’s a shame about the money game at the arcade though, that must have been very frustrating. It was, but the staff were very nice and gave me a few 10ps in return. It was a great day. What a cute rhino calf? I am in love with him. Strangely its tongue was black. I’m not sure you should be telling my son that story Mari!! I know! We spent 10 minutes just looking at him and nothing else. What a fun day out. I haven’t been to a safari park for soooo long! My daughter loves giraffes so being able to see them at their height would be something she’d love! Great idea. Great photos It looks like a wonderful place to visit and I am impressed with the ow entrance fees. This sounds very reasonably for so many attractions. It’s funny how baby rhinos can be cute – I saw two playing together by a watering hole in Africa and they reminded me of kittens! I love the idea of a giraffe viewing platform! Thanks for a frank review that really highlights the best bits (and the drawbacks). Glad you are writing these up Robert. Wish I could get my son to do the same. Love the giraffe picture.